I had a great time speaking today to Ms. Contton's class. 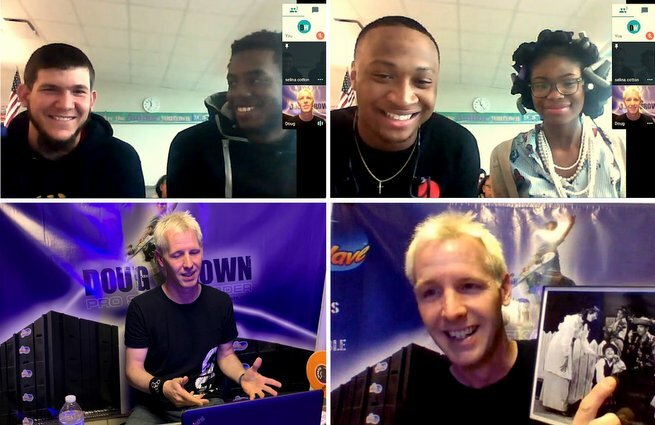 It's been awesome working with DreamWakers reaching so many students through their hosted chat events. The students had great questions and positive energy. Lots more to come! It's hard to put into words my attendance at the VIP reception for the opening of the Ohio Champion of Sports exhibit at the Ohio History Connection museum. It is surreal to be a part of the exhibit and unreal to see my skateboard shining proudly in an illuminated showcase. A flat screen plays the interview about my life filmed over a year ago. I can't believe it all came to fruition after two years in the making. To be beside only a selected amount of professional athletes chosen for this exhibit is truly an honor that I will remember for a lifetime. Many special guests attended this VIP reception, including my family, other athletes and the Ohio governor. There was even an appetizer named after me resting on a skateboard. My entire career as a professional skateboarder has led up to this moment and I am extremely humbled at this monumental milestone. Let the fun begin! 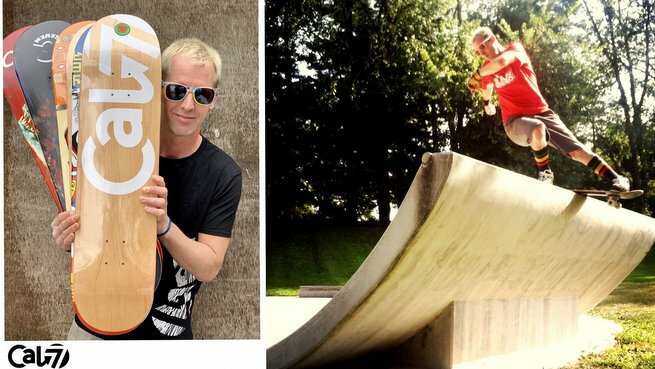 Stoked to be riding for Cal7 Skateboards. Lots of exciting things ahead, stay tuned! 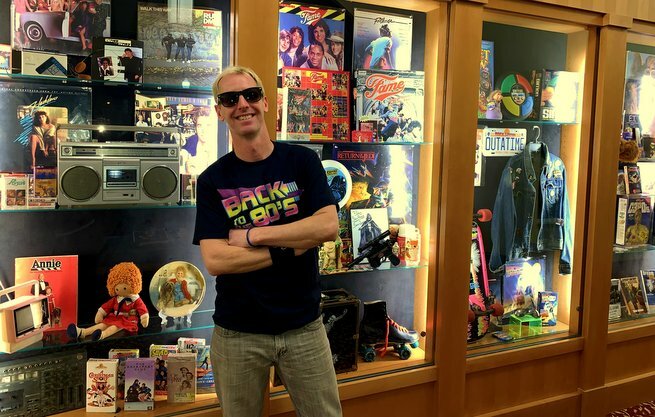 My exhibit Big Wave: Fun in the '80s begins it's tour now at the Wayne County Public Library until the end of February. The exhibit is located at the library in the central gallery. Go back to a neon time with objects that will totally bring radical and tubular memories from the gnarliest decade in history. Lots ahead for 2019. 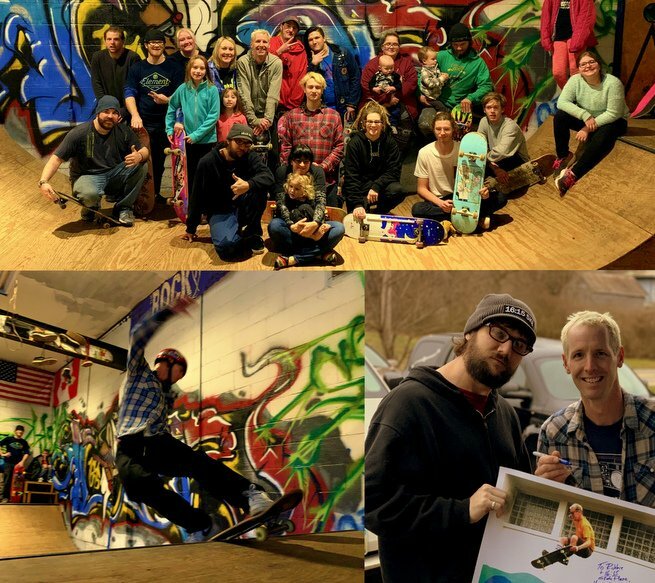 New board and bearing sponsor to be announced soon, stay tuned! 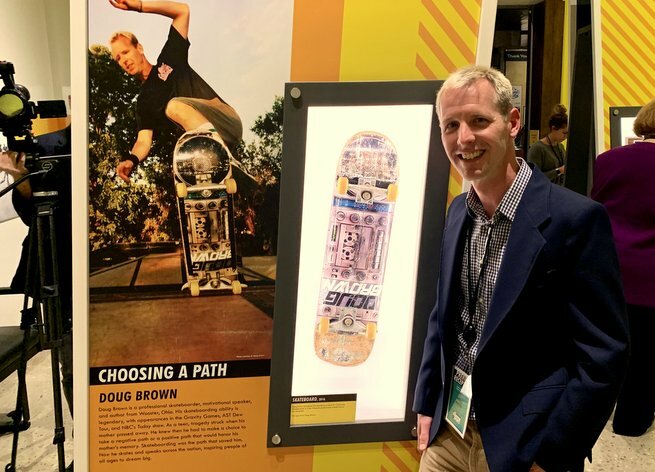 Today one of my pro model skateboards was handed over to the Ohio History Museum for their Champion of Sports exhibit about professional athletes. I'm still so honored to be a part of all this. It was strange to see them put on the gloves and wrap up my skateboard for their inventory in the museum. Special thanks to Eric and Lesley for driving all the way from Columbus to make this happen. Click here for more information on the exhibit. 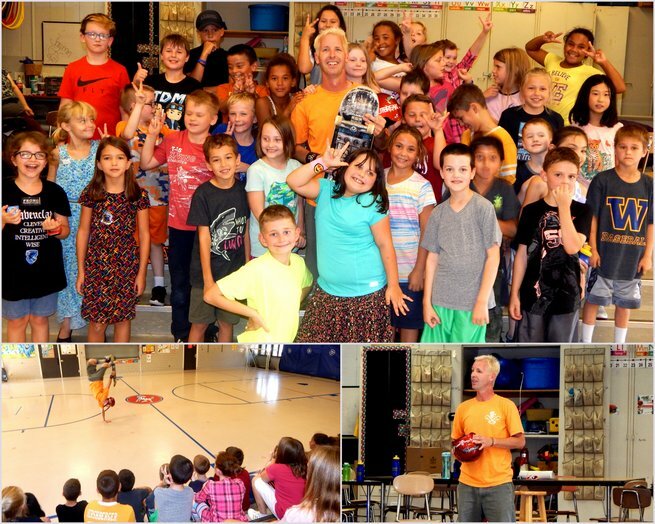 Had a great time reading my new kids book Jumpin' Pumpkins to a special group of students. 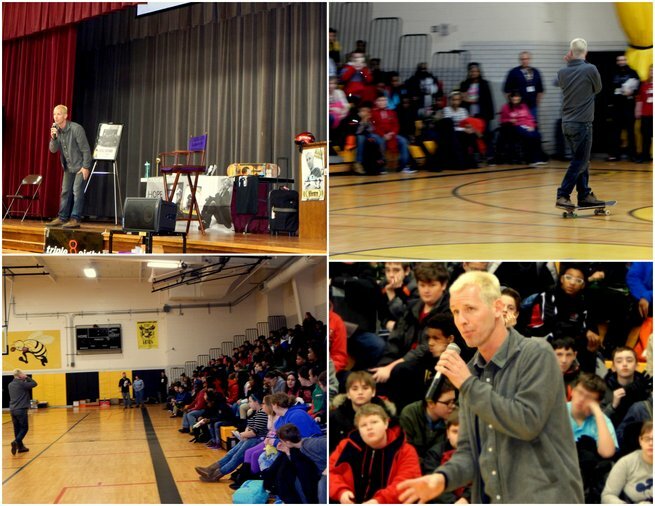 It's been a blast this week visiting all these schools and sharing my new book with everyone. 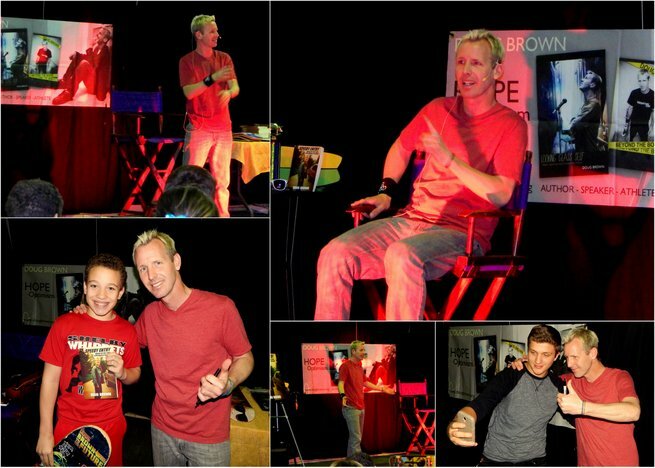 It's been awesome bringing my book to life with such a captive audiences. I love the process of writing and creating and having my work fall into the right hands. Inspiring and reaching people is the most important thing I can do. Always thankful and grateful to where my life has landed me. September 21st, 2018 - New Book! 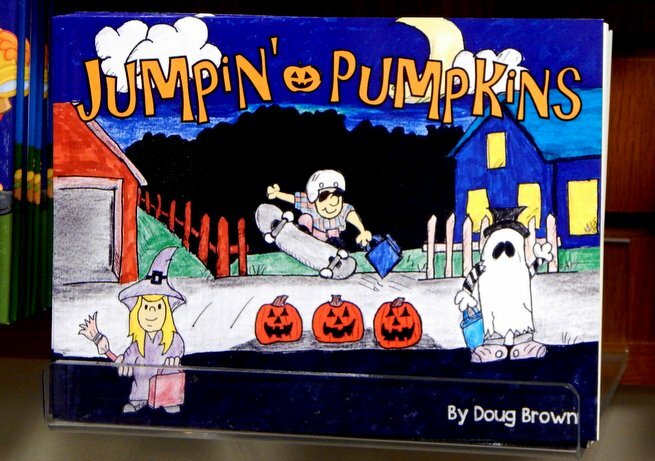 My new book is called Jumpin' Pumpkins. It's my seventh book and my third kids book. It's hard to believe. I really enjoyed working on this project. I did the story and all the illustrations. It was a lot of hard work but I put my heart into and I'm happy how it turned out. The book is in major book stores or Click here to order direct. 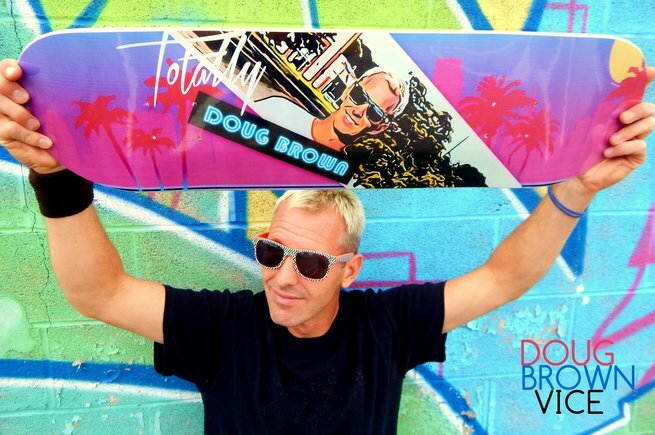 Introducing my new pro model The Doug Brown Vice. This is my 16th pro model skateboard. It's hard to believe. Thank you so much to all the sponsors over the years that made this possible. The new deck will be available everywhere this September. Lots ahead stay tuned! 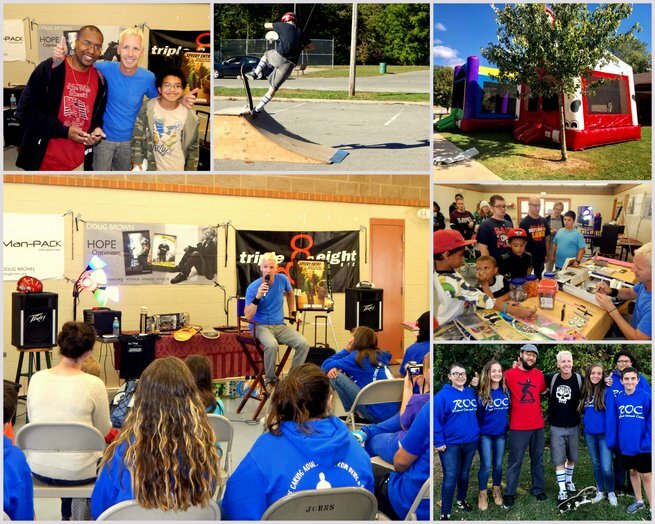 Had a great time at the Howard event with 16:15 complete with face painting, spray painting, games, food, good tunes, skate clinics, and great people. We only had a small cement pad to throw down our demo but it was a blast! 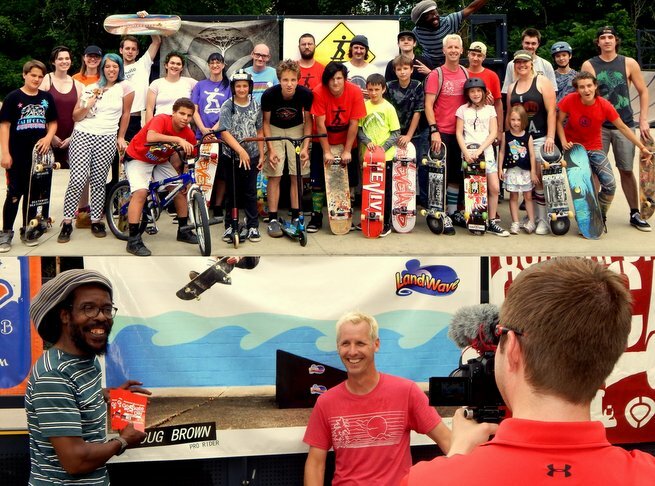 The rain cleared away allowing us to speak, skate, and reach the community. Been on the road. Had a great photo shoot today at the Landwave Ramps headquarters. 5 hours in the sun skating all day with loads of different ramp setups. It's been a super busy month and I'm glad to say I made it to my 45th birthday. So much ahead, stay tuned! Been on the road, lots of events. Had a great time today at the Cardington Street Fair. I've done this event for many years now. Thanks to everyone who came out to the event. Had a great Go Skateboarding Day! The day started with an early meeting with the Ohio State History museum's crew to donate items of mine for their exhibit about professional athletes. 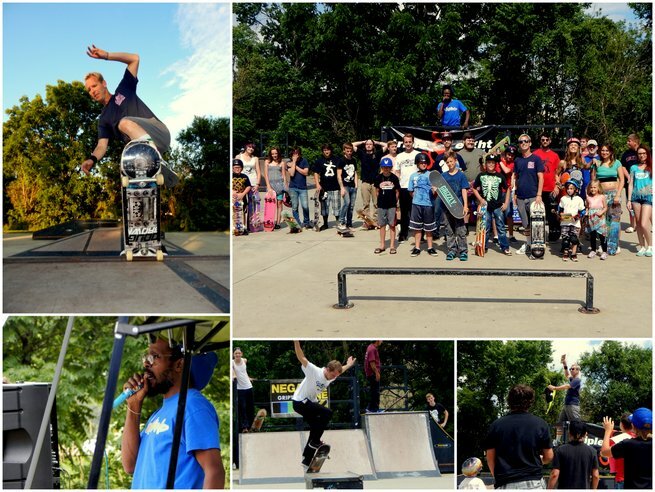 Then it was direct to the Wooster Skatepark for the national Go Skateboarding Day event in my hometown of Wooster. What a great day. 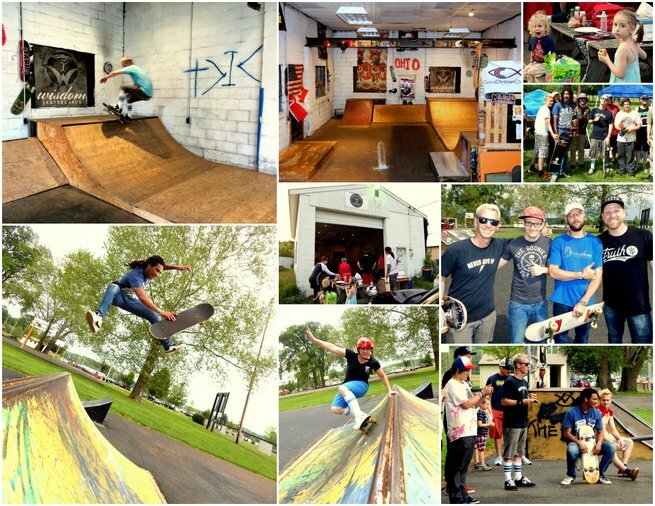 Thanks to everyone who came out - perfect weather, good vibes, good tunes, good food, and great skateboarding. I had a great time speaking to the children at Wee Care Center today. 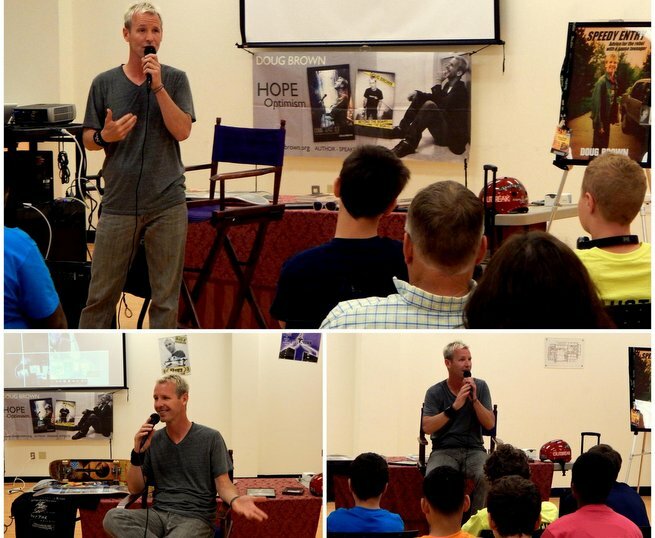 Nothing beats inspiring hope into young minds. They were such a great group full of enthusiasm and interest in my program. Thanks Jill Woods for making it all happen. Had a great time today speaking to Ms. Medukas' 4 & 5th graders at Scott County Schools in Virginia.It was their last day of school and it was an honor to speak to them. Special thanks to DreamWakers and Athletes for Hope for setting this all up. Busy June ahead, stay tuned! Today I was the featured speaker at the "Guys with Ties" final event for Plain Local Schools and Marlington Local Schools at Middlebranch Elementary. It really was a super special group. 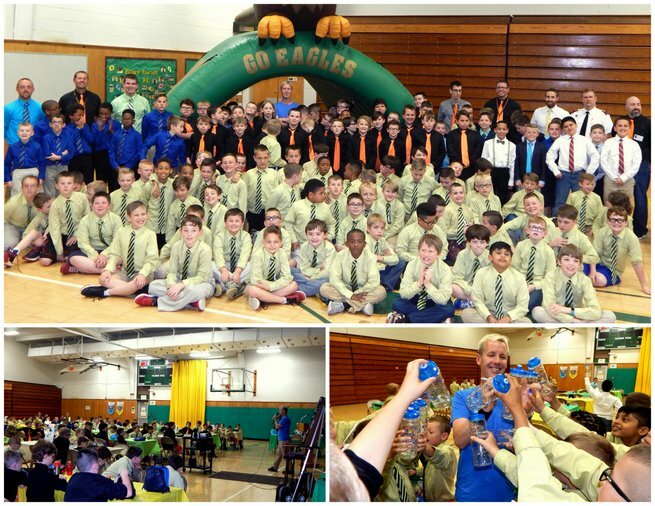 The Guys With Ties program is for 3rd through 5th grade boys. Lessons are taught in everything from giving a proper handshake, setting goals, respecting others, and so much more. Their motto is Look good, Feel good, and Do good. What a great program to help these young men turned into young gentlemen. Many thanks to Kent Hamilton for reaching out to have me come speak and be a part of this special event. Will announce movie details soon. It will be in theaters nationwide in 2019. It's staring KJ Apa (Riverdale) and Maia Mitchell (The Fosters). 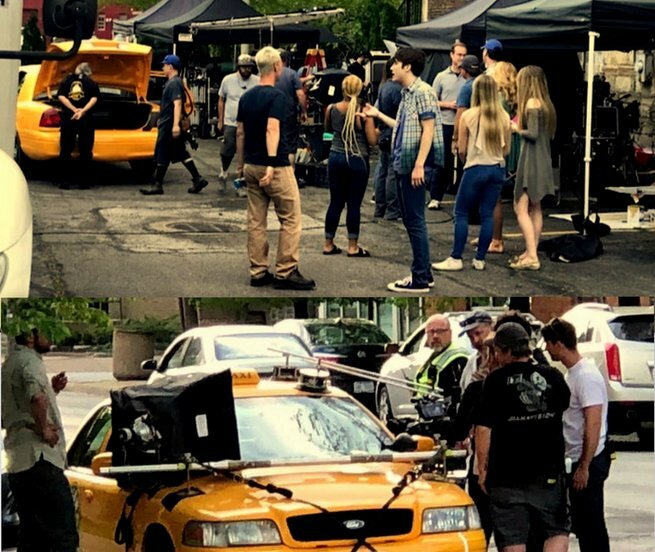 Still more filming days to go. Today I was on the set for 11 hours. This is an exciting project to be a part of. Stay tuned! 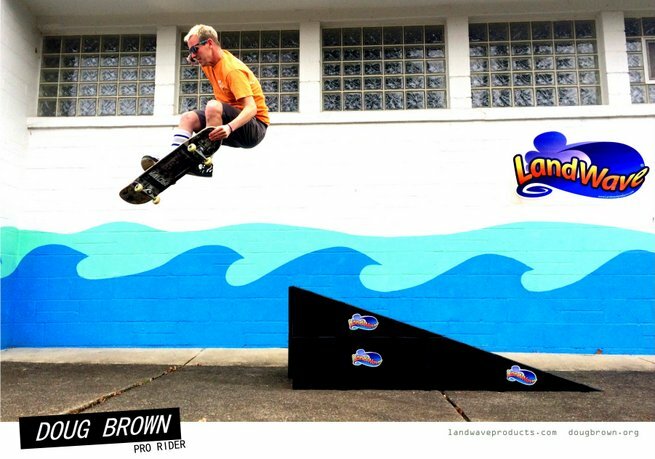 Stoked to be working with my new ramp sponsor Landwave as seen on Fuel TV. Lots ahead stay tuned! Love working with these great people and a great product. Click here to view the new promotional video. Had a wonderful time today doing two hours of Zumba for a great cause. What a truly special afternoon. I had a film crew interview me about my life and my career. I will be part of the Ohio State History museum's exhibit about professional athletes. I had no idea of the size of this project. There will be a 15ft high photo of me with objects from my career and a flat screen playing my interview. I'm beyond honored to be a part of this. Tonight was a really special evening at the Dover Public Library. Thanks so much to all those who attended and traveled so far to get there! Had a great on-air interview today at WJER 100.9 FM radio promoting my new book and my event at the Dover Public Library this Thursday February 22nd at 6:30pm. It's gonna be a great time. Open to all ages. Hope to see you there! Click here for more information. Welcome to 2018! It's been an exciting time. I've be traveling a great deal. While at the Landwave headquarters seeing framed posters of myself in the hallway and offices, lots of love. Excited to start this new sponsorship partnership as a pro rider for the company. Lots of events and happenings to be announced soon! Had a great time today reading my Christmas book to some very special preschoolers.This holiday season has been great! It's a time to reflect and a time to move forward. 2017 was a great year filled with events and purpose. Looking forward to new opportunities and adventures in 2018. 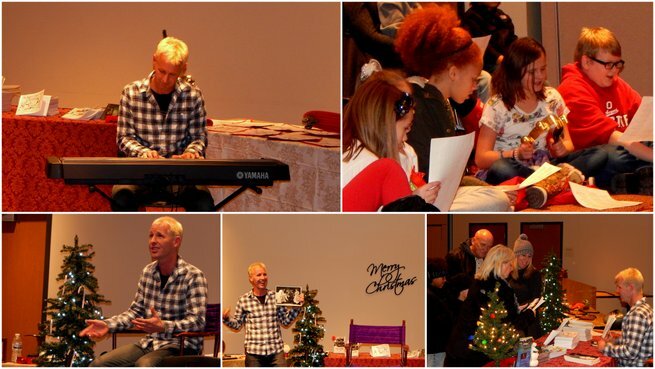 Had a great time doing my Christmas program at the Wayne County Public Library tonight! Thanks everyone for coming out and joining in the fun. Lots going on this holiday season. If you haven't checked out my Christmas book 'The Skater's Night Before Christmas' Click here to order. Stay tuned for updates. 2018 will be a great year! Had a great time today speaking to the students at Avondale Elementary! They were a great energetic group. Many thanks to principal Milford, PE teacher Kent Hamilton and Athletes for Hope for making this happen. Clevnet and the Wayne County Public Library filmed me yesterday to be part of a video promoting the importance of libraries in communities. I've been staying busy with a lot of new projects and events ahead. Stay tuned! The Historical Society contacted me about having some items of mine from my career for their permanent collection. Today I got to drop off the items and have a private tour. I'm so honored to be a part of this. I remember going on a field trip in grade school to visit the Historical Society. I never imagined I would end up in their permanent collection. Many warm thanks to David Broehl with the Historical Society. 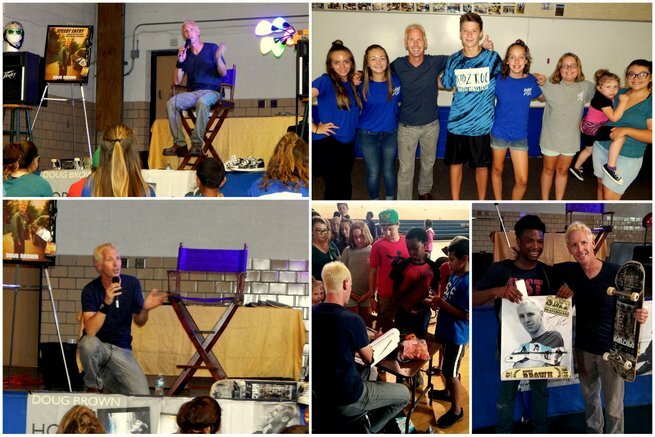 Had such a great time today speaking at North Lake. Thanks to the Richland Outreach Center for all your help. Special thanks to Robbie and crew with 16:15 Skate. 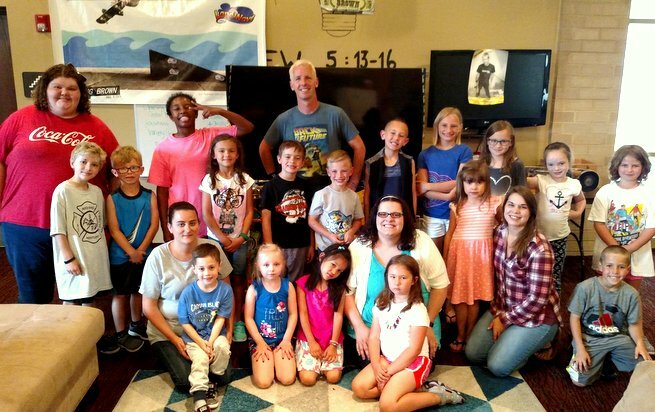 Thanks to Jack Browning and the Kidz Roc youth group. It was awesome to speak to so many different ages and walks of life. There was a special energy in the air. All positive vibes. Everyone left with a smile on their face, including me. Days like today are a reminder of why I do what I do. Reaching others, inspiring, and planting seeds of hope and optimism. Had a blast today speaking to the kids at Melrose Elementary. As a member of Athletes For Hope I'm joining their efforts for Athletes for Active Communities week. This is a joint initiative between Athletes for Hope, Marathon Kids, and Active Schools to help children become more physically active. Lots of upcoming events, stay tuned! Had a great impactful event at the Richland Outreach Center yesterday. What an amazing group of people. Special thanks to Kidz Roc, Robbie Bonar, Jack Browning, and everyone at the Richland Outreach Center for making this all happen. This was a special afternoon I will never forget. Had an amazing weekend on the road. Just today I skated four different skateparks. 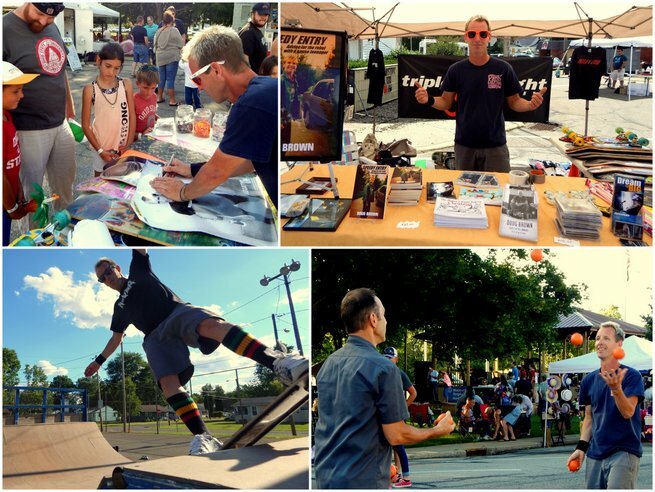 The Cardington Street Festival was a blast. It was a long hot day of skating and meeting lots of different people. 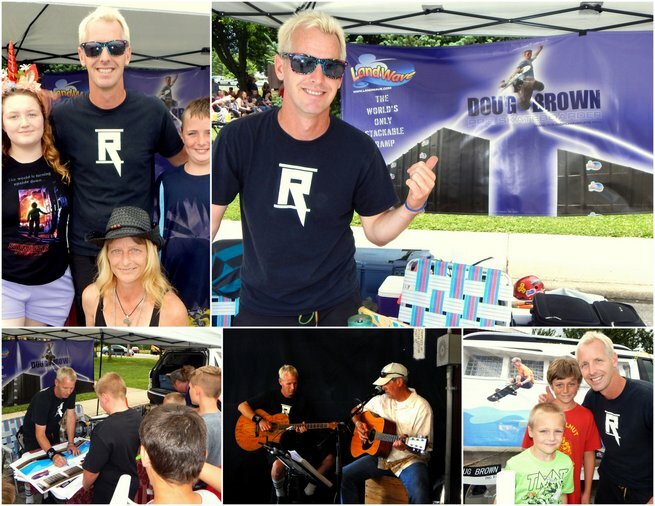 I even got to do some street juggling and demos with bmx rider and juggler Wes Bourne. Many more events ahead, stay tuned! 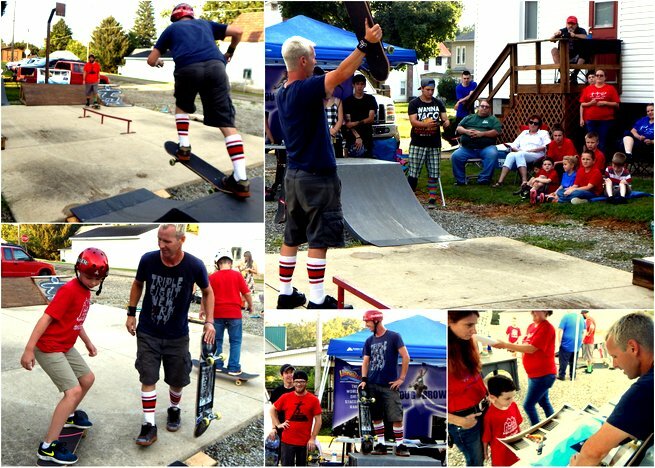 Go Skateboarding Day was awesome today in my hometown of Wooster. Skated non-stop from 12-9pm with great vibes and great people. I was glad I chose to spend the day in the town I began skating in back in 1986. What a great evening speaking at the Wayne County Public Liibrary. I was welcomed with open arms to an electric audience of all ages. Thanks to all the people that drove so far to hear me speak. Looking forward to summer 2017. Until next time! Just found out today that one of my pro model skateboards and two of my books will be part of the Historical Society's permanent collection. It's gonna be a great summer of events, stoked. I had a great time speaking to the students of the Tomorrow Center. It was their last day of school and I was stoked to send them off to summer with my program. They were so receptive and energetic towards me. Thanks to the faculty and students for making this such a memorable time. Lots of events lined up for this summer! Stay tuned. Had an amazing time speaking to the receptive audience today at the Village Network. Many thanks to everyone and the faculty for making it such a great visit. Stoked to announce my 15 pro model will be released this month with Outbreak Boards. 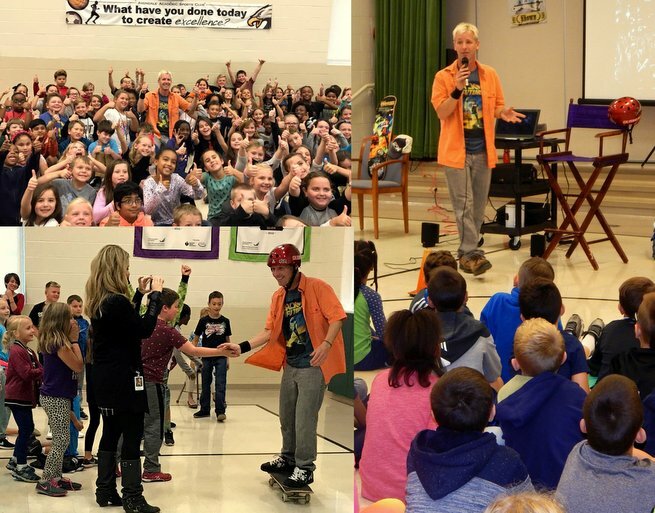 I've been busy as can be skating and doing speaking events. My new book Speedy Entry has been reaching a lot of people and I'm beyond thrilled about this. Stay tuned for more news on upcoming spring and summer events. Lots ahead! Today I honor my mother's memory. 27 years ago today she passed away. This photo was taken today. The sun is shinning with a hidden cloud above. I'm skating for her on this day. Skateboarding was there for me back then and is still here for me today. The medallion graphic on my skateboard is a photo of the actual medallion necklace my mother used to wear throughout her life. My father gave it to her as a gift many years ago. God I miss her. I'm fully alive and live life to the fullest to honor her. I keep her spirit alive through everything that i do. What an amazing evening speaking in Shelby. Thanks to everyone who came to the event. Was stoked how far some people traveled to see my program. 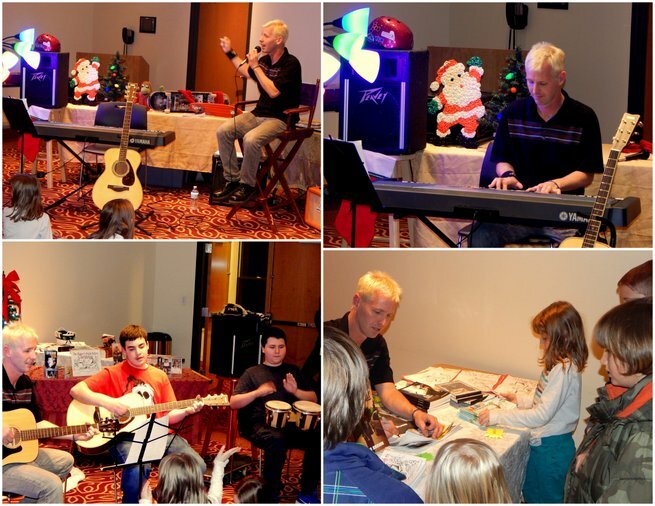 Thanks to Connie and everyone at the Church of the Nazarene for setting this all up.Many more event ahead stay tuned! 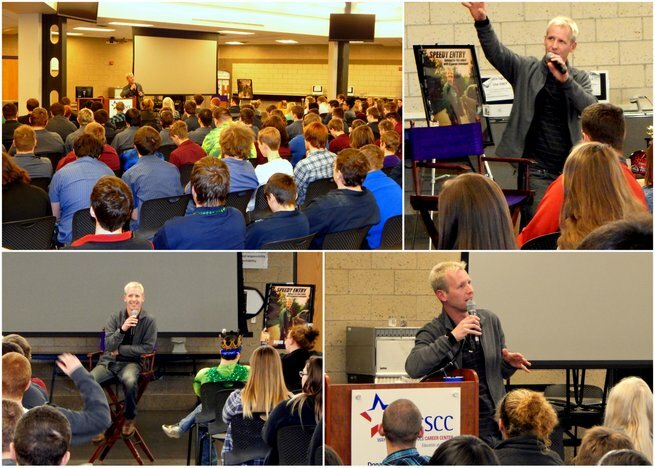 Had a great time speaking to the students of the Wayne County Schools Career Center. Spoke to to two large assertive groups. Thank you Lexi Hartman and the faculty of WCSCC for setting it all up! Had a great book signing last weekend at the Student Parent Teacher's Association event. 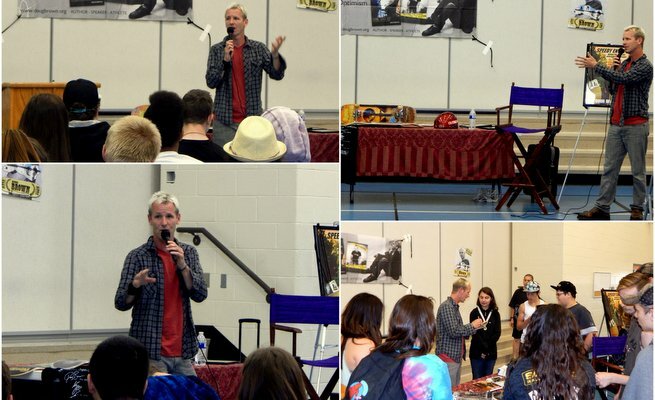 Lots of speaking engagements and events ahead stay tuned! February 16th, 2017 - New Book Speedy Entry On Sale Now! 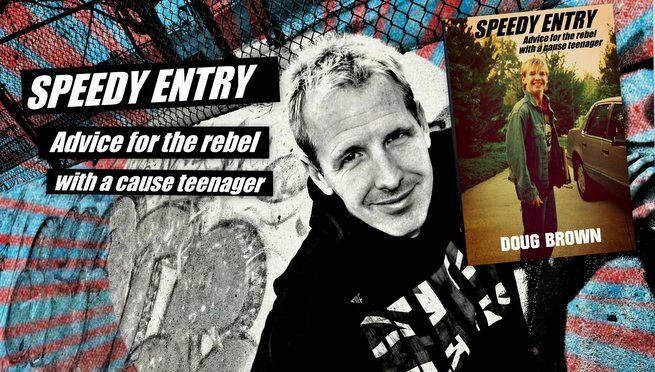 Speedy Entry - Advice for the rebel with a cause teenager. New Book Available Now! Click here to order direct. 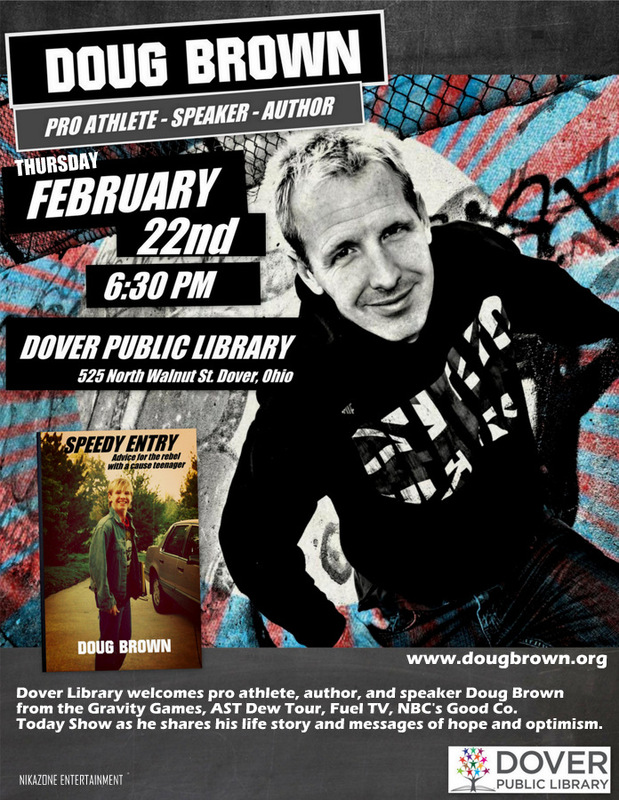 Doug Brown used to get detentions as a teenager for skateboarding in school. Now he's asked to skateboard and speak in schools. This professional athlete, author, and motivational speaker tugs at heart strings with advice for the struggling adolescent. Not far removed from those years, Brown relates his own life experiences with powerful words of wisdom. Had an amazing Zumba fundraiser for the CAC. Thanks everyone for coming out and supporting this cause! Special thanks to Deb Galaz and all the instructors for their time! I can't say enough great things about the STEAMM Academy that I spoke to today. It was a long drive and an early 8am speaking engagement with the students but it was well worth it. 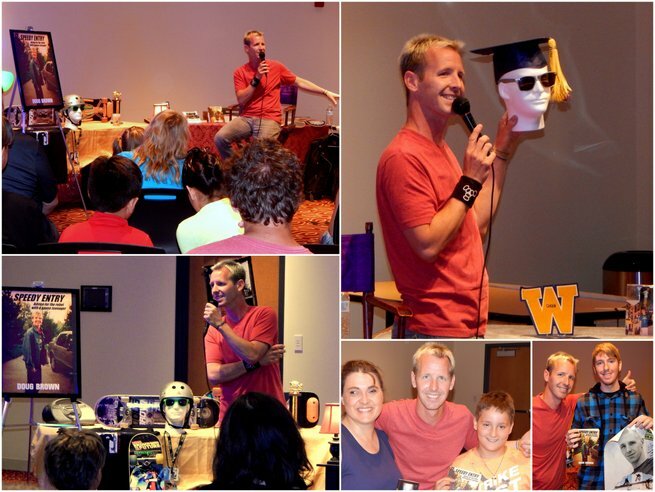 They were such a great energetic group and receptive to my program. Many thanks to Bernie Caldwell and the staff at Hartford middle school for everything. It's visits like this that are a constant reminder of why I do what I do. Had a great time at the Christmas reading tonight! Thank you to everyone who came out to join in the fun. It was great to see so many smiling faces. It was a wonderful evening. Tomorrow morning I will be speaking to the students of STEAMM Academy with my Dream Big program. Just got home from an amazing evening at the Christmas in Cardington event. 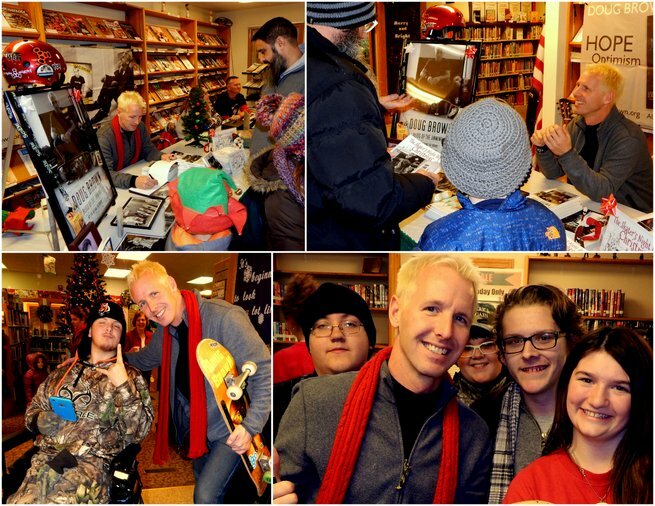 Thanks to everyone who came out to the library book signing! Was great to see so many happy faces with so much Christmas in the air. Was great traveling on the snowy roads to Cardington for the book signing at the library. I passed through the neighboring town of Mt.Gilead where my parents grew up and fell in love. The warm sentimental memories and feelings I had while visiting there filled me up with joy. I also visited my mother's grave in that town. A lot of what I do is to honor my mother's memory and to keep her spirit alive. Today was a special day for many reasons.